Burnt Sienna is glazed over the darker areas of the tree at this point. The blue under-painting must be totally dry before this application is made. When glazing colors be sure to use a very light touch. If you over-brush, or push too firmly on the brush, you will lift the first glaze, mixing the color applications together and creating mud. Use the Burnt Sienna here and there on a few select vines under the coconuts. Work over a very small area with jabbing-type strokes, then quickly rinse your brush clean, touch it to your paper toweling, and touch some of the edges of the still-wet strokes to soften them. Be sure to keep this non-uniform. It is supposed to look organic, not patterned or polka-dotted. 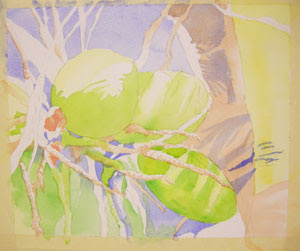 I used Winsor Red to add a few touches of light, warm tones to the flowers under the coconuts. VanDyke Brown was used in the tree trunk and on some of the viney branches to create shadows. Take your time, be selective and practice the brushwork. It can make all the difference in the world when working on organic objects. Allow the edges to be "lost and found", but softening some edges with clear water, and other edges to remain crisp.